For the last couple of weeks we talked about weight loss. Now, with your mind prepared to endeavor on a healthful approach to weight loss, which involves your entire being, it’s time to spruce up your weight loss recipe book with simple, delicious, waist-slimming recipes. Who said that you cannot have fun and enjoy your food while losing weight?! I know that if that was a requirement, I would fail miserably at losing weight and keeping it off, because I love a good bite. Something that will make me roll my eyes to the back of my head on inhale and let out a MMMMMM… MMMMMM… GOOD! on exhale. Americans love their deep fried French fries, Slavs love fried potatoes (genetic make up of my household)–both are a disaster of a combination for weight loss, and a sure way to clog your arteries. I love eating healthy, so, I found a way to marry the two loves without gaining an ounce of extra weight, or raising cholesterol. 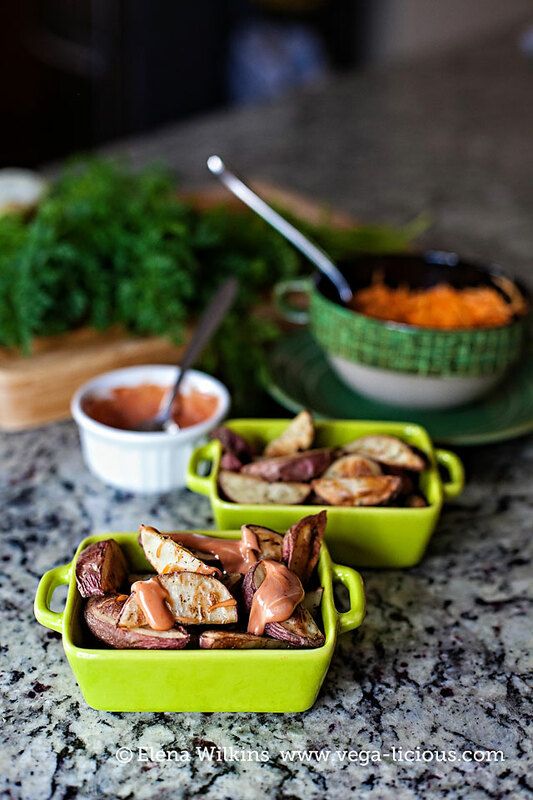 The best solution of all times that I ever came up with in order to save my husband, who, if you let him, could eat fries and chips on a daily basis, was creating the simplest of all dishes in the world–fat free roasted potatoes! They are the perfect marriage of health and taste pleasure. 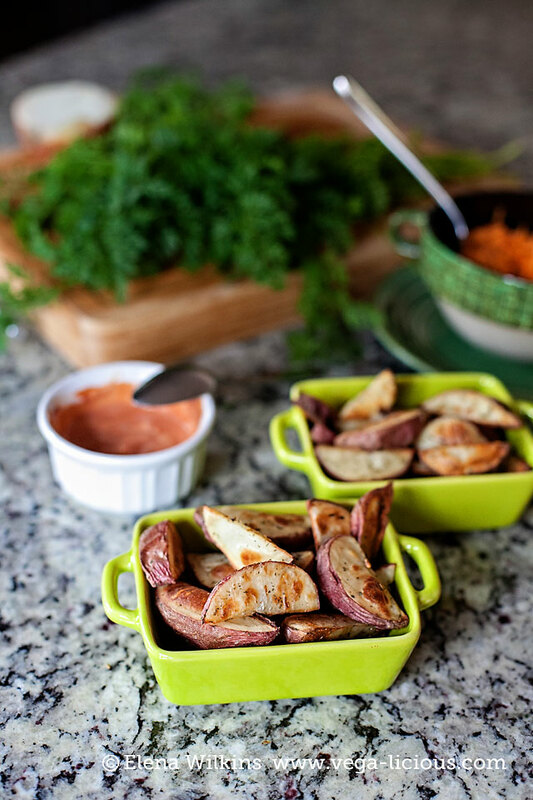 One of the quickest meals to make–especially if you have only minutes to get dinner on the table to feed a hungry crowd–roasted potatoes can come out making you look like a gourmet chef. They are FAT FREE! 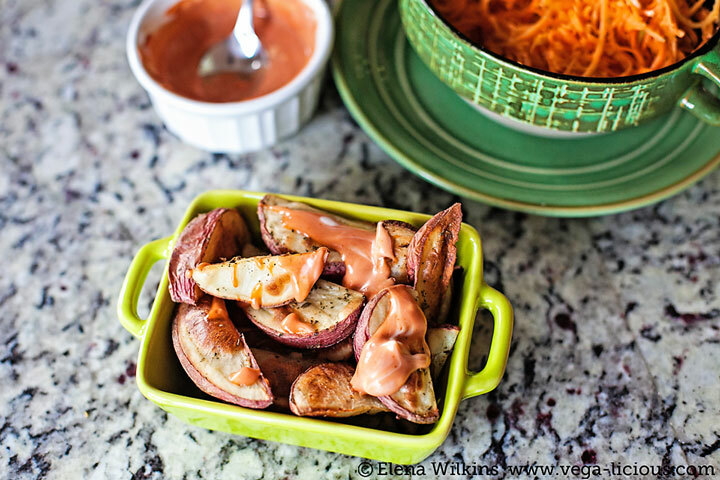 Albeit I am guilty of creating not-so-slimming potato dipping sauce to go with them–a mixture of vegan mayo and ketchup. I know, it seems that the sauce defeats the purpose of making fat free French fry substitute, but it isn’t so! 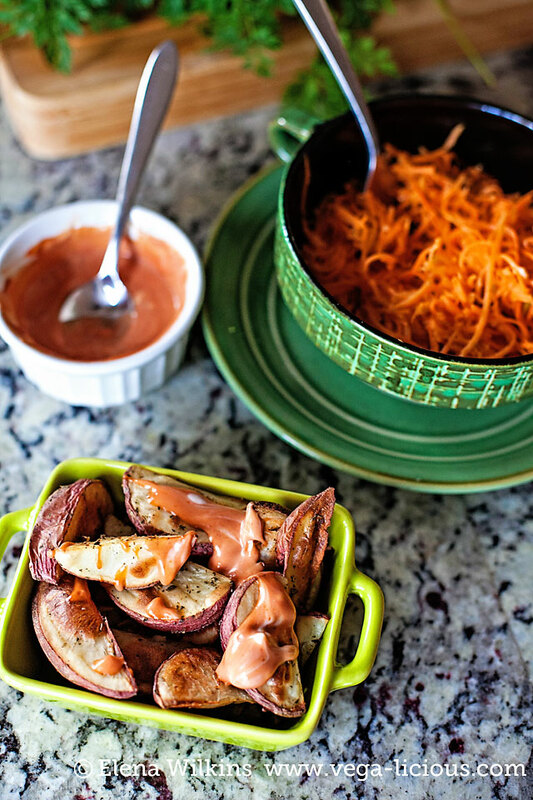 You can skip the dipping sauce altogether, and choose to indulge in roasted potatoes dipped in low fat, oil free, Ranch Dressing, or, if you don’t want to behave, you are still saving hundreds of calories that you would have taken in if you ate deep fried, oil drenched French fries, or had fried potatoes. 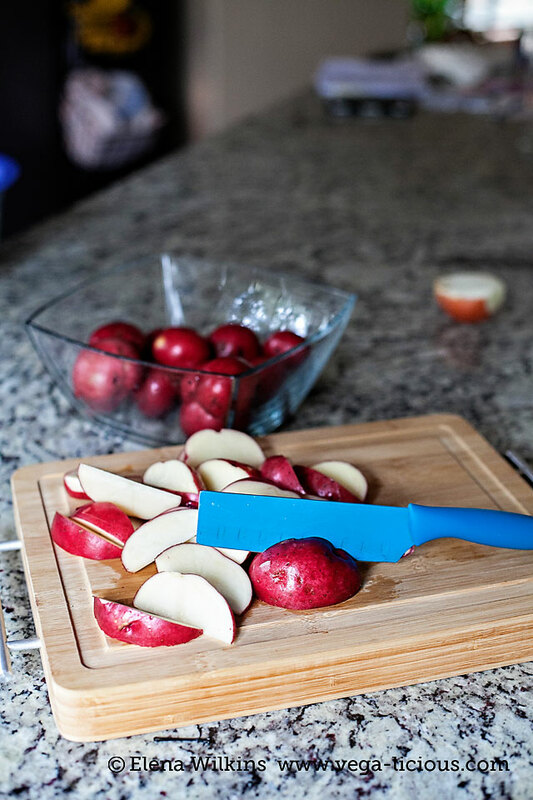 AND, with my recipe, you will also get extra nutrients by keeping the skins of potatoes on–they are filled with fiber and minerals. In fact, most of fiber found in potatoes is stored in the skins, so keep them on. Potatoes themselves are a great source of potassium, B vitamins, copper, vitamin C, manganese, phosphorus, and pantothenic acid. There are many more great health benefits to this blood pressure lowering, cancer fighting, low calorie beloved vegetable, which you can read about here. Take away the bad company potatoes are often forced to keep (butter, oils, dairy and meats), and you get the best weight loss companion you could ever find. 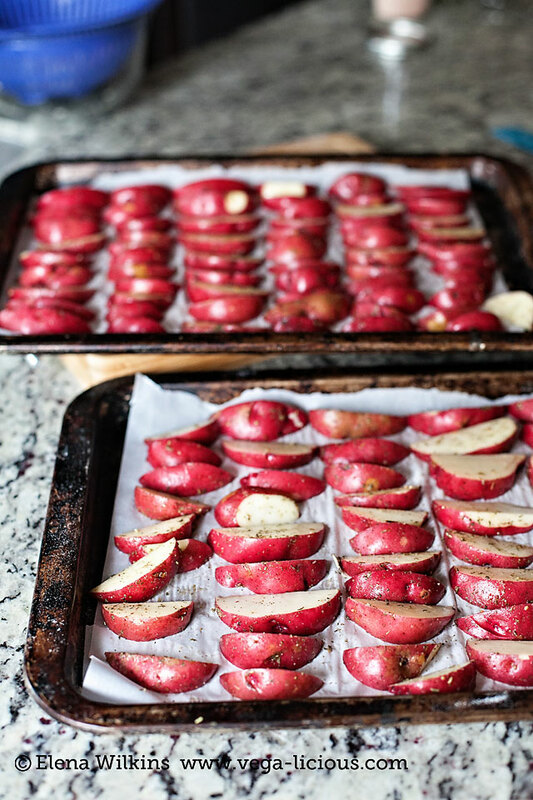 You will love my roasted potatoes, I guarantee it! Your kids will love ’em. Your guests will love ’em. And, if you invite them over, your neighbors will love ’em. A healthy way to satisfy your French Fries craving, without making a dent in your weight loss efforts.